Intel's new Smart Glasses Embedded with A.I. Intel’s new Smart Glasses Embedded with A.I. The power of Wearables comes from connecting our Senses to Sensors. Over the years, we have seen many companies try and fail at the Smart Glasses Game. Google Glasses never had a chance because of that techy and bulky look, and even the Snap Spectacles has come to an end. But that’s not stopping Intel from getting in on the fun. What if smart glasses didn’t make you look like a techno cyborg jerk. That’s exactly what Intel is making. These smart glasses are called Vaunt and they are completely different from what you are expecting. What’s amazing about these glasses is they look normal and they feel really feel light on my head. They only weigh about 50 grams. They are designed to do just one thing, show you simple basic information in one of your eyes. It has this little red monochrome projector that shines an image on a holographic mirror. Which then bounces it directly into the eyeball so you don’t have to focus on it. But the best part is that if you are not looking just slightly down at the display, it completely disappears so it’s not distracting you. The other thing is you are not going to be tapping or swiping like you did with Google Glass. There’s no camera in the frame so it’s meant to be non-intrusive, not annoying in social situations. Vaunt Glasses are a prototype project from Intel’s new devices group and later this year developers are going to be able to start using them. 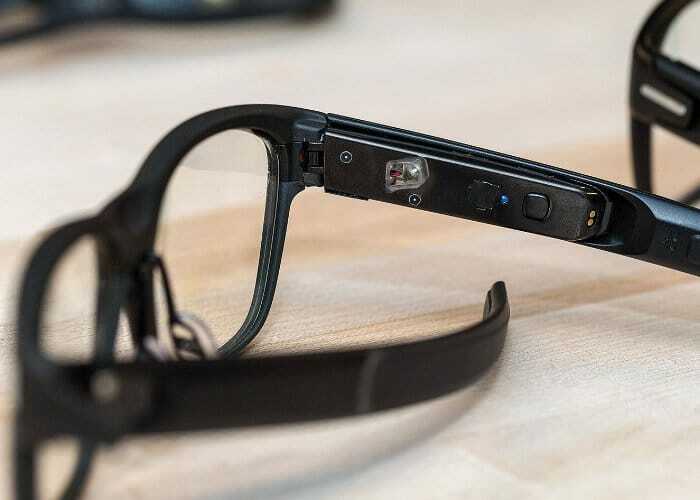 The Intel’s new Vaunt Glasses uses a Processor, and Accelerometer, a Bluetooth chip, a Compass and a low power laser called VCSEL (Vertical-Cavity Surface-Emitting Laser). Intel says “It’s so low power that it’s at the very bottom end of class one laser.” The Engineers at Intel used a holographic grating embedded in the lens to reflect the correct wavelength back to your eye. The image is called retinal projection. So the image is actually painted into the back of your retina. If you wear prescription glasses, the prescription is used for looking at the world but not for the image that is projected to your eye. You can have terrible vision and still see bright, sharp, clear image that looks like it comes from infinity. The Intel has provided a level of behavioural A.I. to their system that allows them to figure out what to show and when to show. Later this year Intel will open an early access program. Where developers can get units and start making stuff that works with the Vaunt. This Intel Glasses will work with both Android and iPhones. Throughout this whole process, Intel will continue to develop its own companion app and A.I. They will release more prototypes with different eyeglass styles.